RENTAL AND RESORT DATA Build your list of Florida based rental and resort operators. IT TAKES JUST FOUR EASY STEPS TO BUILD YOUR RENTAL/RESORT LIST. At least one option must be selected to continue. The first step in generating your Rental/Resort List is to select the geographic locations you wish to target. You can choose to search by counties, cities and/or zip codes. County searches are the "broadest" level of location selection and zip codes are the "narrowest" level of location selection. PLEASE NOTE: YOU MUST ENTER OR SELECT AT LEAST ONE ZIP CODE, CITY OR COUNTY TO CONTINUE TO THE NEXT STEP. 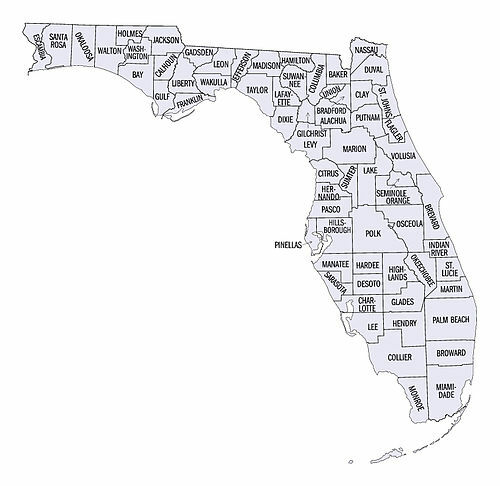 Example #1: To search all counties at once, simply select "Entire State". No further selections will be required. Example #2: To search by one or more specific zip codes, enter the desired zips in the "Zip Code" box and click on the [Add to Zip List] button. Repeat for each additional zip code desired. You can also enter partial zip codes. For example, if you enter "336" your list will include all zip codes starting with 336. NOTE: DO NOT SELECT A COUNTY OR CITY IF YOU WISH TO SEARCH ONLY BY ZIP CODES. Example #3: To search by one or more specific counties, just select the desired counties from the list or using the [Click for County Map] option. A county selection will automatically include all cities and zip codes in that county. Example #4: To search by one or more specific cities, just select the desired cities from the drop down list. A city selection will automatically include all zip codes in the selected cities. Example #5: If you want to simultaneously search a diverse area, you can combine "non-related" counties, cities and zip codes. For example, you can choose to build your list based on Orange County, the city of Tampa, and the 33417 (West Palm Beach) zip code. Click on the [Next] button to continue once your locations are selected. You've picked your locations and now it's time to choose the types of rental/resort operators to include in your list. To begin, select one or more "Types" from the Rental/Resort drop-down list (Bed and Breakfast, Resort Condo, Resort Dwelling, Hotel, Motel, Transient Apartment (Short Term Rentals), Non-Transient Apartment (Long Term Rental), Transient Rooming House (Short Term) and Non-Transient Rooming House (Long Term). You can further refine your Rental/Resort selections by entering a minimum and maximum count for "size" (number of units). Example: If you want to limit your list of Rental/Resort properties to those with "50" units or more, enter "50" in the [Min Units] field. Click on the [Next] button to continue after selections are made. Please Note: The [Label Type] and [US Addresses Only] options apply only to the PDF output type. How would you like to handle duplicate names and addresses? Now that your location and rental/resort filters have been set, it's time to choose your data output type (so we can calculate your list count and related costs). Enter a list description (or accept the default). Select "CSV" if you want your list generated in .csv format (for import into Excel or other applications, as well as to provide names and addresses for mail merge and direct mail printing). CSV lists contain Operator Name, Rental/Resort Type, Contact Name, Contact Mailing Address, Primary Phone Number, Secondary Phone Number, Property Name, Physical Location, License Expiration Date, Last Inspection Date, and Number of Units. CSV data is calculated at .28¢ per record. Select "PDF" if you want your list generated in .pdf format (for printing on labels). PDF labels are formatted to contain Contact Name, Business Name (for care/of), and properly formatted mailing address. Label type must also be selected based on the desired "layout". PDF data is calculated at .15¢ per "label". The PDF Labels option will use the "Mailing Address" for that license record. If you would like labels utilizing the "Location Address" then complete our contact form. Select your duplicate filter. Some entities apply for multiple licenses from the State. You can reduce duplicates by choosing to 'dedupe'. Dedupe by Licensee Names will remove duplicate records where there are duplicate licensee names (corporate owners) with the same mailing address. Dedupe by Business Names will remove duplicate records where there are duplicate business names (Property Name or DBA) with the same location address. PLEASE NOTE: Dedupe will NOT necessarily remove all duplicates as we cannot control form entry errors made by the entities. This is a best effort attempt to reduce duplicates. To calculate your list counts and costs, just click on the [Next] button below. Here we go! Congratulations - List Calculation Success! Are you ready to download your full list? Just click the [Checkout] button below to begin the purchase and download process. Do you want to download only a portion of your list? Just enter the total number of records [Count] you wish to export, click the [Recalculate] button and then [Checkout]. Example: Your list has 1,000 records, but for now, you only want to download the first 500. Just enter "500" in the [Count] field below, then press "Recalculate". Do you want to change any of your current selection criteria? It's easy to return to one or more of the three (3) previous steps and have your list recalculate. Check your email for opt-in verification instructions. Click on a county to add/delete from the Counties selection box.